Amid the tumult of the close season, there's some football to watch in the heart of Edinburgh this weekend. 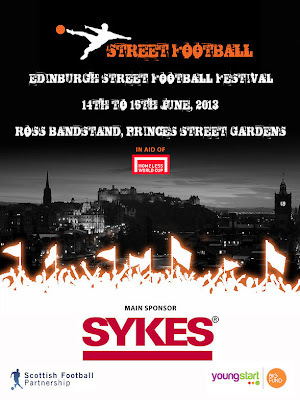 Edinburgh's first Street Football Festival kicks off this morning and runs over Saturday and Sunday at the Ross Bandstand in Princes Street Gardens. Supporting the Homeless World Cup, held at the same venue in 2005, the four-a-side tournament will see youth organisations, school teams and corporate sides strut their stuff in the shadow of Edinburgh Castle. The festival, supported by Sykes Global, aims to raise awareness of the Homeless World Cup which will this year be held in Poland in August. Through its global network of football projects the Edinburgh-based Homeless World Cup helps thousands of people change their lives through football each year. With four players on each side and a stress on attacking, games are fast-paced and full of goals. Draws are decided by sudden death penalty shoot outs. That pace should provide some amusement on Sunday afternoon when a Hibs-Hearts Select - including Mickey Weir, Keith Wright, Henry Smith and Jimmy Sandison - take on players from local teams. Goals, Henry "The Cat" Smith and free entry. The Edinburgh Street Football Festival kicks off at 10 am this morning and finishes at 5.30 pm on Sunday.